Image caption What do the attacks reveal about Afghanistan's security forces? The residents of central Kabul would have experienced a chilling sense of deja vu on Sunday as the first shots that rang out rapidly escalated into a multi-pronged assault on the city. Just over six months ago insurgents targeted the US embassy in the last major co-ordinated attack on Kabul. Then, as now, fighters took up position in a building under construction that offered them a launch-pad for their attack. What many ordinary Afghans are asking is not how could this happen but how could this happen again? What is different this time, more frightening for the city's residents and more chastening for the authorities, is that the militants managed to penetrate the most secure inner circle of Kabul's ring of steel - the Wazir Akbar Khan district. Across the road from the building where attackers based themselves is the highly sensitive intelligence installation, which is constantly under armed guard. There were also many more insurgents involved this time. Earlier this month a briefing by intelligence officials told journalists that the Taliban had lost the power to launch large-scale attacks. It is clear that this once again represents a serious security and intelligence failure - and also that lessons from previous attacks are difficult to act on. The Taliban have been eager to prove that they still have potency and this attack shows both a sophisticated level of co-ordination and that Kabul is not as secure as it needs to be. Whose "victory" this was depends on who you are talking to. 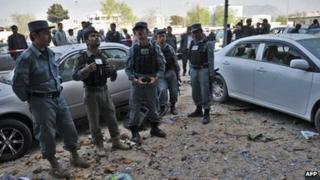 Nato have commended Afghan security forces for effectively defending the city and ultimately quelling the attack. But Afghan forces did need some back-up from helicopters and Nato special forces. Analysts argue that it is in Nato's interest to talk up the ability of Afghan forces to defend the city - it is after all what the exit strategy is predicated on. Simon Gass, Nato's senior civilian representative, told BBC News money spent thus far had been spent well, and that the Afghan police and army were "increasingly capable". But many point out that it was simply luck that Afghan forces spotted the insurgents - who launched their attack prematurely after they were forced to shoot a guard who tried to stop an SUV with fake plates speeding down a one-way road. And it was not an easy fight for the Afghan forces as insurgents took over buildings and also went into residential areas. A senior general in charge of an elite Western-trained unit was badly injured. Ordinary Afghans were also quick to take to the air waves asking questions. Why was it going on so long? How had forces had not been able to prevent the same mistake being made twice? The simultaneous attacks in the provinces also struck fear into Afghans who ask if Kabul's most secure district and provincial centres cannot be protected, what can? The message they appear to be sending out is that the government is weak. Privately, sources say that Afghan security agencies are involved in a blame game, pointing the finger at one another. Despite the rhetoric of not needing international support, this underlines dread about the future. If you listen to the Taliban version of events, however, this was a victory, showing how they could strike at will, when and where they chose. But they did lose the element of surprise they were hoping for when they were spotted prematurely and the area was evacuated quickly, which meant they could not inflict many casualties or enter their choicest targets. Many observers are blaming the Pakistan-based Haqqani network for this attack. And the question many are asking is what such attacks mean for talks with the Taliban. One senior presidential aide said that this particular group of fighters would always have an interest in launching an assault. He says it only proves that there are different Talibans: those who talk, those who fight and those who tread the middle path. The Haqqani network has also expanded its area of operation in Afghanistan - now operating in provinces closer to Kabul. There are several night raids each week targeting Haqqani fighters in these areas. It is easier to recruit insurgents from these restive areas close to Pakistan than send them up all the way from the Taliban's Kandahar heartland in the south. The implication is that if Taliban talks do become meaningful, there will always be a group willing to launch attacks. Western nations and leaders have argued that the surge has worked. But many Afghans are unsure and ask: if in 2012 insurgents can penetrate the very heart of Kabul in such a brazen way, what might they be capable of in 2014 when Nato troops are beginning to withdraw?